First things first: Please do not call the kita. The teachers cannot give any information about the kita or how to apply. We also ask you not to visit unannounced as that disturbs the smooth running of the kita. We all know how difficult it is to find a good place in a kindergarten in Berlin, especially a bilingual kindergarten. That’s part of the reason we founded Zebra Kita in the first place! 1. We are a bilingual kindergarten for English/German speaking children. Most of our kids have one German and one English speaking parent at home, or come from an environment where they are consistently exposed to both languages on a daily basis. The kindergarten is run in both English and German, so it is important that your child can communicate in both languages. Parent meetings are conducted in English. 2. Due to the small size of our Kita, we can only accept children with a full-time Gutschein of 7-9 hours. Unfortunately, we can’t make any exceptions to this rule! 3. Zebra Kita is a parent-run Kita. You, the parents, also have to be willing to really get your hands dirty. We are a committed group actively involved in running the Kita. This involves finances, hiring, maintenance, making sure we are up-to-date on safety and regulations, spring cleaning, planning parties, and much more! Parents also do one cooking shift every 6 weeks or so, and occasionally jump in to help the teachers if we are short staffed due to illness. Effort is required but the rewards are great. You will enjoy a unique view into the nitty gritty of running a Kita, and get to know the other families and kids closely. At least one parent should have enough flexibility to be part of this process. Take a close look at the Concept and make sure you understand it before committing yourself. 4. With very few exceptions (siblings, or children who may fall a few weeks shy of the starting date), children must be at least 2 years old to join the Kita. You are welcome to apply early, but your application will only be seriously considered when your child is close to reaching the minimum age requirement. 2. Name of child, date of birth and gender. Our pool of applications is not a list where you start at the bottom and slowly work your way up to the top as places are filled. When a position becomes available we, the parents and teachers, discuss what type of child is best suited to fill the space that has been vacated. That means finding a match of age, gender, etc. to compliment the group. Once we’ve discussed our options from the applicant pool, we invite a group of families to an informal meeting so we can all get to know each other a little better. We look for warm, enthusiastic families who look forward to becoming a part of the Kita. Unless a child leaves the Kita during the year and needs to be replaced, we only take new children at the start of the new Kita year (beginning of August). We start looking at applicants in January/February, so it certainly helps to drop us a line around that time if you have sent us an application and are still interested! Usually, we will have an Open House sometime in October/November - come to that and let us get to know you! The standard food fee of 23 Euros that you pay at a public Kita applies here as well. Also, families pay an additional fee of 60 euros per month to cover extra food expenses(all organic lunches and afternoon snack), extra staff, Christmas bonuses, etc. The parents may vote to increase or decrease this according to the Kita’s financial needs. 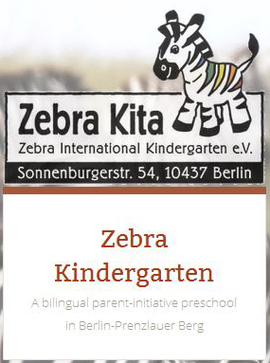 Note that Zebra can only accept children with a Kita-Gutschein for 7-9 hours.